2-part, high-strength, fibrous polyester bonding and repair putty contains long strand milled glass fibers for strength and dimensional stability. Use above or below the waterline. MEKP catalyst included. Excellent bonding strength and impact resistance. Sizes: Quart Kit, GallonKit. MEKP catalyst is included. IMPORTANT: TotalBoat Polyester Structural Repair Putty will not cure in air, and requires overcoating with an air dry material such as PVA (polyvinyl alcohol), paraffin wax additive, polyester finishing resin with wax, gelcoat with wax, or TotalBoat Polyester Fairing Compound, to achieve a proper cure. This general-purpose marine structural adhesive can also be used to join & fillet fiber-reinforced plastic parts, and bond dissimilar materials such as metal and wood. 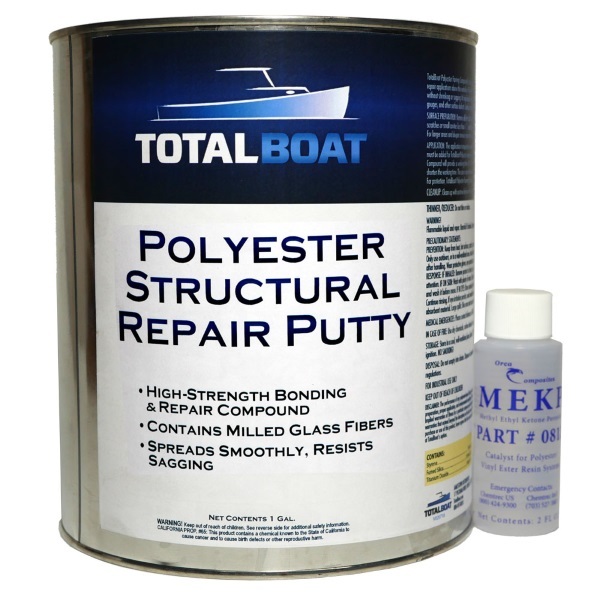 In addition to bonding, TotalBoat Polyester Structural Repair Putty can be used for filling larger voids and cracks in composites, radius forming, and fabricating composite parts. Its high strength and versatility make this fast-setting structural adhesive, filler, and repair compound a must for any composites shop. Catalyst: Catalyze with 1-2% MEKP, based on mass, ambient conditions, and desired working time. More catalyst will shorten working time, but will maintain working time at cooler temperatures. Working time: For a 100g mass, catalyze with 1% MEKP for approximately 15-20 minutes of working time at 70°F (14 drops of MEKP catalyst per ounce of Polyester Structural Repair Putty). Cure time: Dependent on temperature, catalyst amount, and mass of Polyester Structural Repair Putty. For example, cure time will be 20-30 minutes for 100g mass catalyzed with 1% MEKP @ 77°F. Cure methods: Air dry agents – Paraffin wax (4 oz. of wax per gallon of putty), or PVA (polyvinyl alcohol); Vacuum method – vacuum bag. Shelf life/stability: Approximately 3-4 months (can be longer, depending on storage conditions). Keep container closed tightly, and store in a cool (below 75°F), well-ventilated place. This high-strength polyester putty is engineered for structural bonding, filling, & fairing, not for cosmetic fairing. For repairs requiring a fine finish, use TotalBoat Polyester Fairing Compound over cured Polyester Structural Repair Putty. Allow the Polyester Fairing Compound to cure, then sand to achieve an extremely smooth surface ready for gelcoat or paint. Always wear protective clothing and equipment to protect your eyes, skin, and lungs when working with TotalBoat Polyester Structural Repair Putty. Personal protective clothing should include appropriate protective gloves, safety glasses or goggles, a proper respirator, and a proper apron or similar protective clothing. Keep away from heat, hot surfaces, sparks, open flames, and other ignition sources. No smoking. Only use outdoors or in a well-ventilated area. Store in a cool, well-ventilated place (below 75°F). Do not handle until all safety precautions have been read and understood. Polyester resins have a limited shelf life and will, over time, harden in the container without the addition of catalyst. Shelf life is dependent on a number of factors such as product formulation and storage conditions. As a general rule, the shelf life for uncatalyzed polyester resins should be up to 6 months when stored in dry, cool conditions below 70°F. Warm to above 60°F before use.